When my children were little, I often use to hide “things” in their bags. Words of encouragement, cards, or a heart shaped sweet at Valentine’s Day. I cannot claim to be the world’s greatest mom, but I truly tried. I still do. I saw my daughter, Victoria today for the first time in two weeks. Yay me! It appears a little of me did rub off on her. Last year she left me a post it note on my mirror that said “Smile beautiful!”. Some days the note made me smile, other days I smiled with tears. The glue eventually gave up on me smiling and it fell to the floor. I very quickly found it. It was a bit of gold in my day. Thank you my little chicken. I really needed every single one of these today…. My favourite being “You are loved”. I hope this encourages you to reach out to someone in kindness, with gentle words and love. You can make a very real difference with a simple act. Previous Article Paint your picture blue and grey. Next Article ‘n Paw Paw vir my Darling! 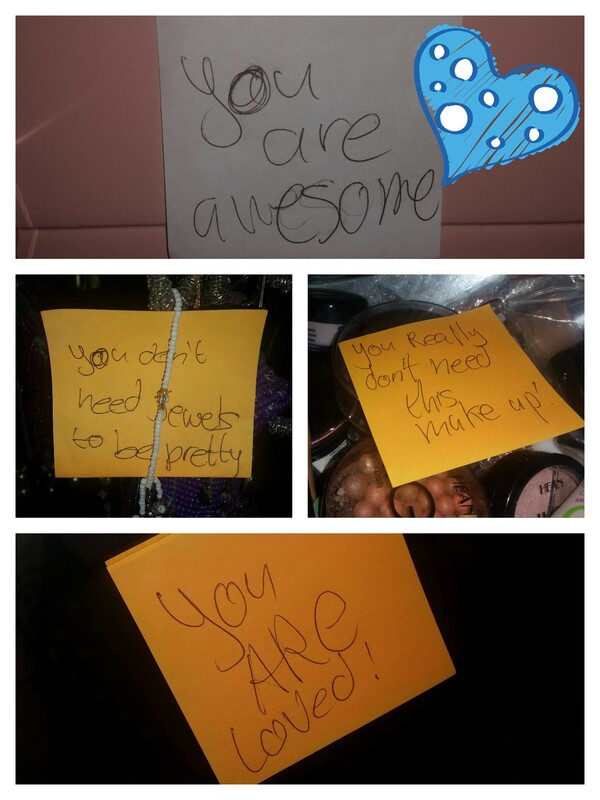 I love that those notes are still up all over the house.